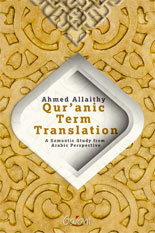 This book is mainly concerned with the meaning and English translation of Qur’anic terms which are therefore, analyzed both out of and in context. This book establishes a method of investigation and analysis that linguists and translators could adopt when embarking on analysis of lexical items of the Qur’an and/or when translating it. Owing to the intrinsic difficulties inherent in the translation of the Qur’an, analytical studies on Qur’anic terms are almost unheard of, in spite of the fact that many are the works that deal with the Qur’an in all languages. Bearing in mind that ‘perfect’ translation is no more than an illusion, and that absolute synonymy is nothing but a myth, establishing the meaning of specialized Qur’anic terms with any degree of accuracy is an extremely daunting task, especially when addressing this issue in a language that is not that of the Qur’an. The present work is an attempt to bring the Qur’an a step closer to both the general reader as well as the specialized researcher. In addition to the semantic study of the Qur’anic terms and investigating their translations in six other renowned works, this book also addresses a number of important linguistic and cultural issues that no serious researcher of the Qur’an can afford to miss. Its depth of analysis and extensive notes are meant to save the reader the extraordinary effort required to check a multitude of works necessary to understand the issues at stake. Ahmed Allaithy obtained his PhD in Comparative Translation of the Holy Qur’an from the University of Durham, UK. He is an Associate Professor of Translation, and the current President of Arabic Translators International (ATI) (www.atinternational.org). He is also the General Editor of ATI-Academic Series, and ATI-Literary Series (Arabic Literature Unveiled). He is an established translator and linguist, writer and poet with many works to his credit. He is a specialist in Translation Studies, Arabic Language, Qur’anic Studies, Arabic Rhetoric and Intercultural Communication.